Grand Prix winner Becky Jenkins on Blackhall Park Penny Lane. 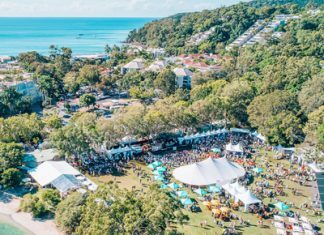 The Sunshine Coast Showjumping Club’s Grand Weekend of Showjumping had to be moved from the grassy showgrounds to the sand and indoor arenas, because of incessant rain on the first two days. The intrepid showjumpers and their horses were undeterred so none of the show’s classes were cancelled. Friday night’s top class, the 1.30m height class, was won by Victorian World Cup rider Ross Smith in a tight finish that saw him come home one second in front of Kilcoy’s Olivia Hamood. The two top class of the show, the Junior Championship and the Grand Prix, were won by the daughters of Australian Olympians. Saturday night’s Junior Championship was won by Maleah Lang-McMahon, the daughter of Olympian Peter McMahon, and Showjumper Michelle Lang. This couple have been featuring recently on Channel 7’s program about re-training ex-racehorse. In their equine business they help to train and rehabilitate race horses. The sun shone for Sunday’s Grand Prix. Only 12 riders competed in this event, though several had more than one horse able to compete at this level. Two World Cup riders battled it out for first place. Olivia Hamood, who had three horses entered, had a double clear on her bay gelding, in a time of 60.35 seconds. Doing a clean, faster round, of 53.29 seconds, was Becky Jenkins, on her superb grey mare Blackall Park Penny Lane. Becky is the daughter of Olympic show jumper Robbie Allen. 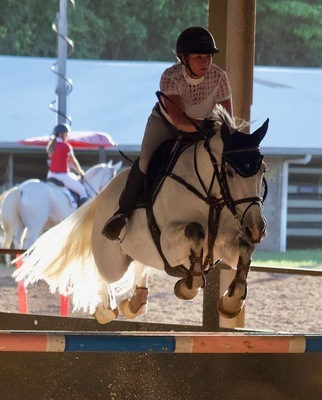 A mother of two small children, Becky is married to fellow show jumper Stuart Jenkins, and together they operate the Fairview Stud, breeding successful showjumping warmblood horses. This year for the first time the club has acquired generous sponsorship from Crick Motors, who are giving the club $300 per month, plus $300 for every Volkswagon Amarok sold to club members. Cooroy showjumping family the Raymonts organised this large successful show with Sue doing entries, Paul building courses, and son Jamie organising sponsors and riders.